NEW YORK, N.Y., July 6, 2017 — MCW (Miracle Corners of the World), a New York-based non-profit organization dedicated to empowering youth to become positive agents of change in their communities, celebrated its 13th annual gala on June 22 at New York University’s Kimmel Center for University Life. The organization honored prominent individuals and organizations that share its mission and sustain its programs through their personal leadership and generous philanthropic support. 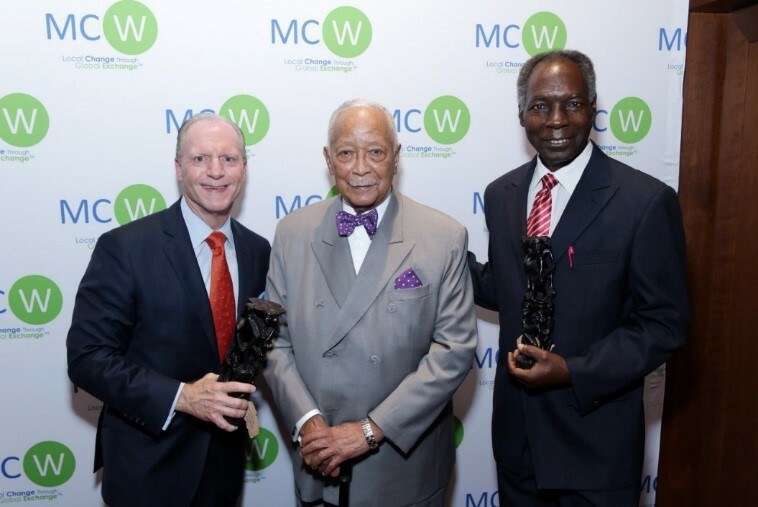 With more than 400 guests in attendance, the event raised more than $1 million—a new milestone—to support MCW’s Young Leaders, Community Development, and Oral Health Care programs in the United States, Africa, and around the world. Bergman also took time to acknowledge the presence of Mayor David Dinkins, the 106th Mayor of New York City and an Honorary Chair at this year’s gala. Liz Claman, anchor at FOX Business Network, welcomed guests, and Ali Velshi, anchor and business correspondent at NBC News, served as the event’s Master of Ceremonies. The night included updates on MCW’s programs, as well as a silent auction and a special musical performance by Freddie Kimmel and Kate Loprest. The MCW Lifetime Achievement Award was presented to Dr. Emil Kikwilu, Professor and Former Dean, MUHAS Dental School, Tanzania. Dr. Kikwilu was critical in the establishment of the MCW-MUHAS infrastructure upgrade in 2009. His commitment to MCW’s mission through his support during the installation of dental operatories and chairs, X-ray machines, sterilizers, compressors, dental instruments, new cabinetry and sterilization centers was critical in the success of the dental school upgrade. Dr. Kikwilu’s award was presented by Dr. Marion Bergman, Director, Health Care Projects, MCW; John Spencer, President of DCI International; and Dr. Anne Eiting Klamar, President and CEO of Midmark Corporation. The MCW Community Partnership Award was presented to Anthony Dalessio, Long Island Managing Partner, KPMG LLP. “One of KPMG’s core values is giving back to the communities in which we live and work. Helping youth make a difference by enabling change in their communities around the world is a great way to pay it forward. It aligns perfectly with KPMG’s values and makes the world a better place for all,” said Dalessio. KPMG is one of the world’s leading professional services firms and provides innovative business solutions and audits, tax, and advisory services to many of the world’s largest and most prestigious organizations. Anthony was instrumental in MCW’s partnership with KPMG for the “KPMG Family for Literacy” program in 2011 at MCW’s community center in Chanyanya, Zambia (MC-Zambia). The program provides children from low-income families with their own new books—and in many cases, their very first book. The partnership expanded in 2013 when KPMG’s Zambia office visited MC-Zambia’s center once again to distribute holiday cards and books to students from the Chanyanya basic and community schools. The award was presented by Stanley Bergman, Chairman of the Board and CEO of Henry Schein, Inc. and Steven Paladino, Executive Vice President, Chief Financial Officer of Henry Schein Inc. The company has been a strong supporter of MCW since its inception through Henry Schein Cares, the company’s global corporate social responsibility program. Photos from the event can be viewed on Facebook.